“A gentle response defuses anger, but a sharp tongue kindles a temper-fire” (Proverbs 15:1 The Message). The fifth biblical step toward restoring a relationship is to attack the problem, not the person. You cannot fix the problem if you’re consumed with fixing the blame. You must choose between the two. The Bible says, “A gentle response defuses anger, but a sharp tongue kindles a temper-fire” (Proverbs 15:1 The Message). Do you have a relationship that drives you crazy? Maybe it’s a spouse, sibling, parent, co-worker, or the crazy relative that really pushes your buttons. 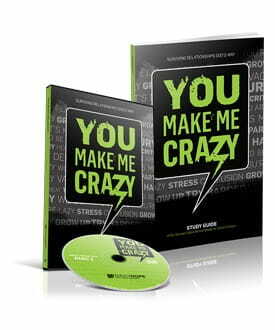 Pastor Rick shows how you can turn crazy relationships into peaceful ones through his You Make Me Crazy Study Kit. This 6-week video study includes a DVD and study guide—and helps you . . . The You Make Me Crazy Study Kit is our thank you for your gift to share the hope of Jesus Christ through Daily Hope! Request your copy today when you give below. May it help you learn to love even the most difficult people in your life.